The Road to Unfreedom : Russia, Europe, America / Timothy Snyder. London : Bodley Head, 2018. Contents: Individualism or Totalitarianism -- Succession or Failure -- Integration or Empire -- Novelty or Eternity -- Truth or Lies -- Equality or Oligarchy. Book Jacket: "The past is another country, the old saying goes. The same might be said of the future. But which country? For Europeans and Americans today, the answer is Russia. Today's Russia is an oligarchy propped up by illusions and repression. But it also represents the fulfilment of tendencies already present in the West. And if Moscow's drive to dissolve Western states and values succeeds, this could become our reality too. 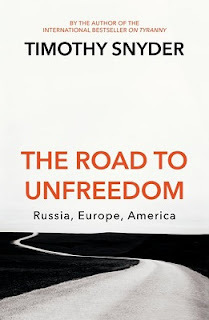 In this visionary work of contemporary history, Timothy Snyder shows how Russia works within the West to destroy the West; by supporting the far right in Europe, invading Ukraine in 2014, and waging a cyberwar during the 2016 presidential campaign and the EU referendum. Nowhere is this more obvious than in the creation of Donald Trump, an American failure deployed as a Russian weapon. But this threat presents an opportunity to better understand the pillars of our freedoms, confront our own complacency and seek renewal. History never ends, and this new challenge forces us to face the choices that will determine the future: equality or oligarchy, individualism or totalitarianism, truth or lies." --PUBLISHER'S NOTE.